After hearing that there are at least 20 new courts being built just in Cairo, it occurred to me that facilities in Britain seem to be disappearing at an inversely proportional rate. What with the Sobel and Finsbury Leisure Centres in London under threat, Flint Pavilion in north Wales set to close and clubs in Leicester, Morley, Harrow and the famous Lambs Club all gone or in the process of losing courts, a click on the Provision link at the top of this page does not make for optimistic reading. "... to build a world-class sports centre at the University of Surrey in Guildford. A centre that provides opportunities for all students, graduates, staff and the local community to access outstanding sporting facilities. 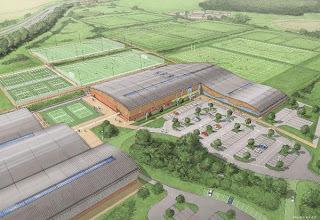 A centre where talent is nurtured and where a new generation of athletes can realise its potential." It is not yet clear how the total cost of the project will be met (especially given what appears to be an ambitious opening date), though a series of events are taking place in order to contribute to funding. Readers feeling generous can make a donation to the building fund here.